Slinky Demonstrations of P and S Waves: The P and S waves have distinctive particle motions (Figures 1-4) and travel at different speeds. P and S waves can be demonstrated effectively with a slinky (the original metal slinky works best). For the P or compressional wave, have two people hold the ends of the slinky about 3-4 meters apart. One person should cup his or her hand over the end (the last 3-4 coils) of the slinky and, when the slinky is nearly at rest, hit that hand with the fist of the other hand. The compressional disturbance that is transmitted to the slinky will propagate along the slinky to the other person. Note that the motion of each coil is either compressional or extensional with the movement parallel to the direction of propagation. Because the other person is holding the slinky firmly, the P wave will reflect at that end and travel back along the slinky. The propagation and reflection will continue until the wave energy dies out. The propagation of the P wave by the slinky is illustrated in Figure 5. Demonstrating the S or Shear wave is performed in a similar fashion except that the person who creates the shear disturbance does so by moving his or her hand quickly up and then down. This motion generates a motion of the coils that is perpendicular to the direction of propagation, which is along the slinky. Note that the particle motion is not only perpendicular to the direction of motion but also in the vertical plane. One can also produce Shear waves with the slinky in which the motion is in the horizontal plane by the person creating the source moving his or her hand quickly left and then right. The propagation of the S wave by the slinky is illustrated in Figure 6. Notice that, although the motion of the disturbance was purely perpendicular to the direction of propagation (no motion in the disturbing source was directed along the slinky), the disturbance still propagates away from the source, along the slinky. The reason for this phenomenon (a good challenge question for students) is because the material is elastic and the individual coils are connected (like the individual particles of a solid) and thus transmit their motion (disturbance or deformation) to the adjacent coils. As this process continues, the shear disturbance travels along the entire slinky (elastic medium). P and S waves can also be generated in the slinky by an additional method that reinforces the concept of elasticity and the elastic rebound theory which explains the generation of earthquakes by plate tectonic movements (Bolt, 1993, p. 74-77; 2004, p. 113-116). In this method, for the P wave, one person should slowly gather a few of the end coils of the slinky into his or her hand. This process stores elastic energy in the coils of the slinky that are compressed (as compared to the other coils in the stretched slinky) similar to the storage of elastic energy in rocks adjacent to a fault that are deformed by plate motions prior to slip along a fault plane in the elastic rebound process. 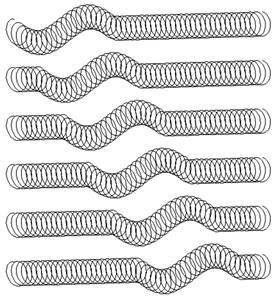 When a few coils have been compressed, release them suddenly (holding on to the end coil of the slinky) and a compressional wave disturbance will propagate along the slinky. This method helps illustrate the concept of the elastic properties of the slinky and the storage of energy in the elastic rebound process. However, the compressional wave that it generates is not as simple or visible as the wave produced by using a blow of one’s fist, so it is suggested that this method be demonstrated after the previously described method using the fist. Figure 1. 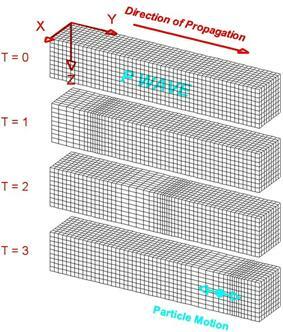 Perspective view of elastic P-wave propagation through a grid representing a volume of material. The directions X and Y are parallel to the Earth's surface and the Z direction is depth. T = 0 through T = 3 indicate successive times. The disturbance that is propagated is a compression (grid lines are closer together) followed by a dilatation or extension (grid lines are farther apart). The particle motion is in the direction of propagation. The material returns to its original shape after the wave has passed. Figure 2. 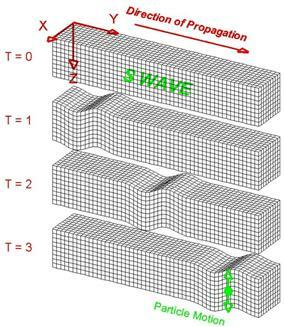 Perspective view of S-wave propagation through a grid representing a volume of elastic material. The disturbance that is propagated is an up motion followed by a down motion (the shear motion could also be directed horizontally or any direction that is perpendicular to the direction of propagation). The particle motion is perpendicular to the direction of propagation. The material returns to its original shape after the wave has passed. Figure 3. Perspective view of Rayleigh-wave propagation through a grid representing a volume of elastic material. 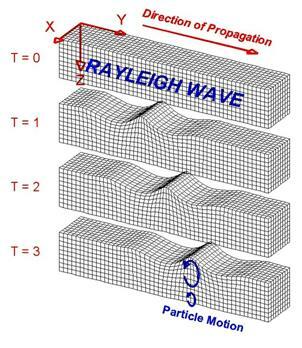 Rayleigh waves are surface waves. The disturbance that is propagated is, in general, an elliptical motion which consists of both vertical (shear; perpendicular to the direction of propagation but in the plane of the raypath) and horizontal (compression; in the direction of propagation) particle motion. The amplitudes of the Rayleigh wave motion decrease with distance away from the surface. The material returns to its original shape after the wave has passed. Figure 4. Perspective view of Love-wave propagation through a grid representing a volume of elastic material. Love waves are surface waves. The disturbance that is propagated is horizontal and perpendicular to the direction of propagation. The amplitudes of the Love wave motion decrease with distance away from the surface. The material returns to its original shape after the wave has passed. Figure 5. Compressional (P) wave propagation in a slinky. A disturbance at one end results in a compression of the coils followed by dilation (extension), and then another compression. 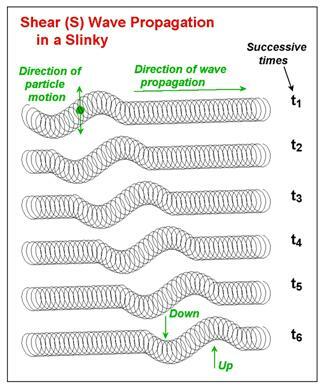 With time (successive times are shown by the diagrams of the slinky at times t1 through t6), the disturbance propagates along the slinky. After the energy passes, the coils of the slinky return to their original, undisturbed position. The direction of particle motion is in the direction of propagation. Similarly, using this "elastic rebound" method for the S waves, one person holding the end of the stretched slinky should use their other hand to grab one of the coils about 10-12 coils away from the end of the slinky. Slowly pull on this coil in a direction perpendicular to the direction defined by the stretched slinky. This process applies a shearing displacement to this end of the slinky and stores elastic energy (strain) in the slinky similar to the storage of strain energy in rocks adjacent to a fault or plate boundary by plate tectonic movements. After the coil has been displaced about 10 cm or so, release it suddenly (similar to the sudden slip along a fault plane in the elastic rebound process) and an S wave disturbance will propagate along the slinky away from the source. Surface Waves: The Love wave (Figure 4) is easy to demonstrate with a slinky or a double length slinky. Stretch the slinky out on the floor or on a tabletop and have one person at each end hold on to the end of the slinky. Generate the Love wave motion by quickly moving one end of the slinky to the left and then to the right. 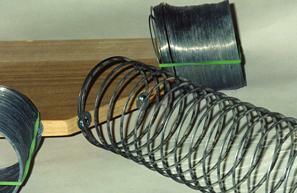 The horizontal shearing motion will propagate along the slinky. Below the surface, the Love wave motion is the same except that the amplitudes decrease with depth. Using the slinky for the Rayleigh wave (Figure 3) is more difficult. With a regular slinky suspended between two people, one person can generate the motion of the Rayleigh wave by rapidly moving his or her hand in a circular or elliptical motion. The motion should be up, back (toward the person generating the motion), down, and then forward (away from the person), coming back to the original location and forming an ellipse or circle with the motion of the hand. This complex pattern will propagate along the slinky but will look very similar to an S wave. Rayleigh wave motion also decreases with depth below the surface. Excellent illustrations of the wave motion of Love and Rayleigh waves can also be found in Bolt (1993, p. 37). 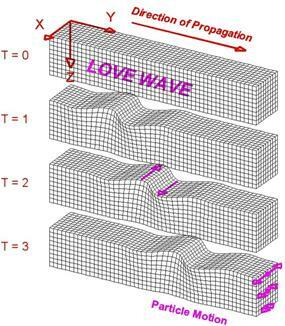 Further details on the characteristics and propagation of Love and Rayleigh waves can be found in Bolt (1993, p. 37-41). Figure 6. Shear (S) wave propagation in a slinky. A disturbance at one end results in an up motion of the coils followed by a down motion of the coils. 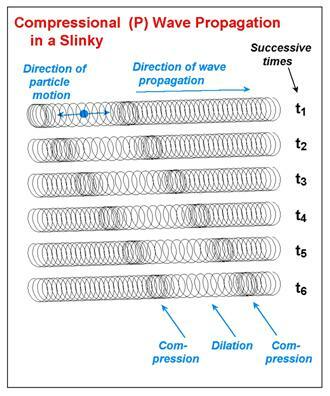 With time (successive times are shown by the diagrams of the slinky at times t1 through t6), the disturbance propagates along the slinky. After the energy passes, the coils of the slinky return to their original, undisturbed position. The direction of particle motion is perpendicular (for example, up and down or side to side) to the direction of propagation. Wave Propagation in All Directions: An additional demonstration with P and S waves can be performed with the 5-slinky model. By attaching 5 slinkys to a wood block as shown in Figure 7, 5 people can hold the ends of the 5 slinkys (stretched out in different directions to about 3-4 m each). One person holds the wood block and can generate P or S waves (or even a combination of both) by hitting the wood block with a closed fist or causing the block to move quickly up and then down or left and then right. The purpose of this demonstration is to show that the waves propagate in all directions in the Earth from the source (not just in the direction of a single slinky). Attaching an additional slinky (with small pieces of plastic electrical tape) to one of the five slinkys attached to the wood block makes one slinky into a double length slinky which can be stretched out to 6-8 m. For one of the other four slinkys, have the person holding it collapse about half of the coils and hold them in his or her hands, forming a half slinky, stretched out about 1½ - 2 m. Now when a source is created at the wood block, one can see that the waves take different amounts of time to travel the different distances to the ends of the various slinkys. An effective way to demonstrate the different arrival times is to have the person holding each slinky call out the word "now" when the wave arrives at their location (if the people holding the slinkys close their eyes and call out when they feel the wave arrive, their responses may be more accurate). The difference in arrival times for the different distances will be obvious from the sequence of the call of "now." This variation in travel time is similar to what is observed for an earthquake whose waves travel to various seismograph stations that are different distances from the source (epicenter). Although these two demonstrations with the five slinky model represent fairly simple concepts, we have found the demonstrations to be very effective with all age groups. In fact, the five slinky demonstrations are often identified the “favorite activities” of participants. Figure 8. Photograph of the five slinky model. Figure 9. Close-up view of five slinky model showing attachment of slinky using screws and washers (holes are 6.3 cm apart, screws are #6, ½” long, washers are 3/16”). wave types and wave characteristics. One can also use slinky activities for authentic assessment by asking students to show their understanding by performing the demonstrations in class. Connections to National Science Education Standards (National Research Council, 1996): Teaching Standards: inquiry-based (A,B); opportunity for assessment (C). Professional Development Standards: opportunity for learning new Earth science content (A,C); suggestions for effective teaching strategies (B). Assessment Standards: authentic assessment (C). Content Standards: Science as Inquiry – practice inquiry and fundamental science skills (grades 5-8 and 9-12, A); Physical Science – properties of matter, motion, transfer of energy (grades 5-8, B), structure of matter, motion, interactions of energy and matter (grades 9-12, B); Earth and Space Science – relate to energy in the Earth system (grades 9-12, D). Bolt, B.A., Earthquakes and Geological Discovery, Scientific American Library, W.H. Freeman, New York, 229 pp., 1993. Bolt, B.A., Earthquakes, (5th edition; similar material is included in earlier editions), W.H. Freeman, New York, 378 pp., 2004. Earthquake, NOVA series videotape, 58 minutes, available from 800-255-9424; http://www.pbs.org, 1990. Living with Violent Earth: We Live on Somewhat Shaky Ground, Assignment Discovery series videotape, Discovery Channel, 25 minutes, http://www.dsc.discovery.com, 1989. National Research Council, National Science Education Standards, National Academy of Sciences, Washington, D.C., 262 pp., 1996. Shearer, P. M., Introduction to Seismology, Cambridge University Press, Cambridge, UK, 260pp, 1999.
ãCopyright 2001-2006. L. Braile. Permission granted for reproduction for non-commercial uses.